We all have an erstwhile preoccupation with time - a relentless and lasting integer of existence. A rolling ticking constancy of where we are and where were going at a certain moment, in a sequential period or periods of consequence. Time is probably the first thing we think of when arising in the day. And then we search for moments of displacement, where we can find time to rest or make a meeting or an number of other heartfelt exigencies, we draw straws in order to plan our time line. Emancipator by Wolf Drawn added. looks roughly like a new take on the recumbent bicycle, with legs replacing wheels. The Panterragaffe is a 2 person peddle powered walking machine, or ambulatory vehicle that emulates the successful design of the kinetic sculptures of Theo Jansen's Strandbeests, cf. 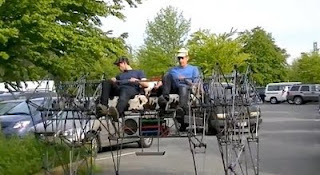 "Panterragaffe is a pedal powered two person walking machine; a walking bicycle. The name has a few elements to it. It's a play on pantograph, a mechanism for copying drawings, which is similar to the leg mechanism. Also; Pan - all or spanning. Terra - earth. Gaffe - an unintentional act causing embarrassment to it's originator or just goofy-ness. A bit of goofy-ness for everybody." In the video young knee high to a grasshopper Aahil spells out the vehicles name as the makers assemble and prepare to play for the first time at Ambleside Beach, West Vancouver. "Panterragaffe was conceived from the beginning as a public performance piece. It's purpose had shock value and public participation in mind from the start. After building a seven inch prototype, it was clear that a mobile entertainment platform was possible. It was only a small step after that to decide to add a power source, music and lighting to suit different events. The rough frame allows us to add character coverings, Panterragaffe can dress up differently ever time it goes out." is a video by 2D Photography Inc., (David Dvir) and shows just about everything a professional photographer has in his kit, studio and some to create an impactually entertaining chain reaction event. The level of painstaking effort involved in making the Rube Goldberg Machine work perfectly means an extraordinary amount of time patience and persistence to get each little sequence working perfectly. In case your not familiar with Rube Goldberg machines; Reuben Goldberg is best known for a series of popular cartoons depicting complex gadgets that perform simple tasks in indirect, convoluted ways. Read more. 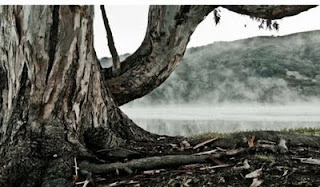 The earrie, creepy and ghostly sound effects frequently heard in the soundtracks of horror movies employ the use of a waterphone. Here in the video below we are entertained by cellist Alexis Savelief with Richard Waters' Waterphone MegaBass musical instrument invention, playing a basic experimental / discovery session rather than an actual piece of music. 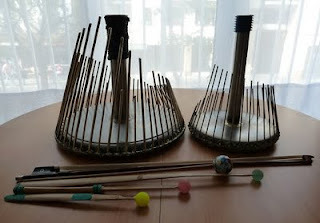 "For this video I played without water inside the Waterphone (no water wa-wa effect) to show how great sounding the instrument is even when played "dry!" It is best to use a bass bow, but since I am a cellist, I play better with a cello bow. In the video I tried to show that depending on bow pressure and speed, different notes can be played on just one rod!" Click here to view more information and videos of the MegaBass Waterphone. is a new take on an old idea, featured in a 1938 edition of Mechanics And Handicraft, which never caught on, but recently reworked by Curtis Boirum, a grad student at Bradley University. Curtis engineered a mobile robot that uses a hemispherical omnidirectional gimbaled, or HOG, drive wheel, that is both a steering and a driving mechanism based on a spinning sphere. This unique system consists of a black rubber hemisphere that rotates like a spinning top, with servos that can tilt it left and right and forwards and backwards. In the video below watch Curtis's remotely controlled robot car delivered by his simple drive system, exhibiting an unbelievable amount of speed and agility. Curtis is working at scaling up his reinvention to create a cheap, powerful, and agile singularity drive system that can be adapted for use by researchers and hobbyists. 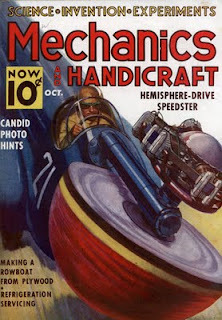 Perhaps he may get around to building a conventional car-sized version too ! 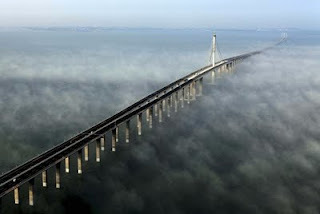 is a long highway bridge with a cable-stayed portion across Hangzhou Bay in the eastern coastal region of China. The marathon-length links the center of the booming port city of Ningbo in eastern China's Zhejiang province with the municipality of Jiaxing spanning the wide blue waters of Hangzhou Bay. With a total length of 35.673 km (22 mi), the bridge is expected to carry over 30,000 cars a day and will cut the commute between the city of Qingdao and the sprawling suburb of Huangdao by between 20 and 30 minutes. Including the engineering and technological development, the project took fourteen years at a cost of 55.5 billion pounds, and the sheer scale and location of the bridge meant that the 600 researchers and expert engineers needed to overcome many complex problems. They had to overcome the three biggest tides on Earth, the effect of typhoons and the difficult content of the sea soil. Read more, here. A video report from China's CCTV News, here, outlines how the convenience of a faster route will boost economic activities in the region. Here is a humorous video, advertising carbonated flavored water although it's title suggests that it was also an ad for hair growth products. This creatively entertaining TV commercial was a Gold winner at the Cannes Lions 2011 and B Creative, is a Creative blog based on advertising, fashion, architecture, tutorials and design Inspiration.